Sri Chandrasekharendra Saraswathi Maha Swamigal (20 May 1894 – 8 January 1994), was the 68th pontiff of Kanchi Mutt (Kanchi Kamakoti Peetham). 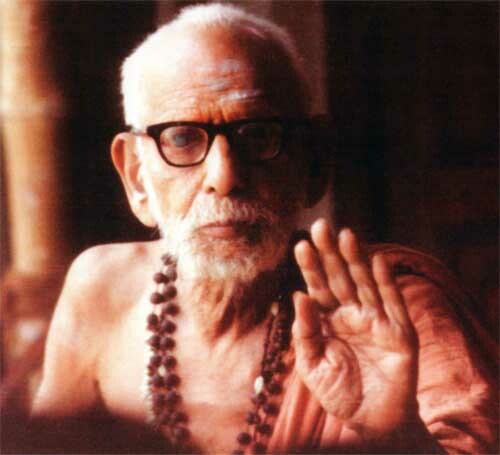 He was also known as the Sage of Kanchi or Mahaperiyava. This is a collection of quotes of Sri Chandrasekharendra Saraswathi Swamigal. One must not keep a long face, wear a scowl or keep lamenting one’s hardships. If you lose your cool you will be a burden to yourself as well as to others. Anayasa is a great virtue. Anayasa means not to feel any mental strain. Obstacles, inevitable to any work or enterprise, must not cause you any mental strain. You must not feel any duty to be a burden and must develop the attitude that everything happens according to the will of the Lord. Purity is to be maintained in all matters such as bathing, dress, food etc. Cleanliness makes you happy and it even appeases your hunger. To see a clean person is to feel ourselves clean. Heart burning caused by another man’s prosperity or status is jealousy. We ought to have love and compassion for all and ought to be patient and forgiving even towards those who do us wrong. We must not envy people their higher status even if they be less deserving of it that we are, and at the same time, must be mature enough to regard their better position as the reward they earned by doing good in their previous life. When adversities overtake us, we blame God and complain that He is blind to our misfortunes. But if we indulge in a little introspection, we will realize that our faults are so enormous that we are utterly unworthy of His grace and, in spite of that we are able to get food, shelter and clothing. It is due to the abundant mercy of God. We must consider the difficulties we encounter as a blessing in disguise. A mother may tie the hands of her child who has the propensity to pick up and eat mud. This seeming cruelty of the mother is for the good of the child. Similarly troubles are verily God's grace to save us. In the entire picture of life, troubles form but a tiny spot. In our inability to visualize the past and the future, we complain when we suffer in the present. A proper perspective will enable us to understand our present plight in its proper setting. Neither the raw fruit nor the tree wants to leave each other. But when the fruit becomes ripe, this attachment automatically disappears. Man requires to experience anger, jealousy, passion, etc. just as the fruit had to undergo various stages of growth and taste before it became fully ripe so to get automatically detached from the tree. We cannot overcome these experiences – anger, jealousy, passion, etc – in the beginning. But we must ponder over the fact why we undergo these experiences. Otherwise we will be the losers. We will become slaves of these experiences and can never achieve fulfillment or contentment. By education we realize Truth. There are many truths, History is one truth. Geography is one truth, Mathematics is one truth. The content of truth is the greatest in Mathematics. In others, there is an element of imagination. In Geography, we come across names Asia, Africa, Madras, Calcutta, etc. These names were given by us. By imagination, we have given names ‘plateau’ ‘valley’, etc. By a process of gradual elimination of all that is imaginary, when we arrive at truth, that Truth is found to be God. To think of Him with real devotion is the fruit of education. Parameswara and Sriman Narayana are one and the same in reality. They are not two. This is the conclusive view of all the ‘shastras.’ Names differ, forms are different, occupations vary, but the reality which is within Them is one and the same. The first step in this process of enlightenment is to make a man truly a man, by ensuring that he does not live on an animal level. The second step is to raise him to the heights of divinity. All religions have this goal. They may represent different systems of thought and philosophy. But their concern ought to be that man is not condemned as he is today to a life of desire and anger. All religions speak in one voice that man must be rendered good and that he must be invested with the qualities of love, humility, serenity, and the spirit of sacrifice. ‘Upasana’ is ‘dhyaana’ or concentration or meditation. A form is required for concentration. Reality is always the same and changeless. ‘Brahman’, as the Ultimate Reality, is Formless. But ‘Upasana’ of a form is done with a purpose, namely, the attainment of a given benefit. The purpose to be attained by worshipping or concentrating on a form differs. The scriptures tell you how to meditate and on what all forms and with what results. For ‘Upasana’, you have to follow the ‘shastras’ or Scriptures. Scriptures prescribe ‘Upasana’ in order to train the mind to concentrate. ‘Upasana’ is the affair of the individual; there is nothing collective about it. Sorrow and anger are two forms of unrequited desire. Anger is packed with more evil power than even desire. If we think that those who are a hindrance to the gratification of our desire are inferior to us, we turn our anger against them, and if we think that they are superior, all we do is to grieve within ourselves. Desire, anger, hatred, fear, all these appertain to the mind, not to the Self. When his mind is slave to discontent, anger, and envy, he cannot have peace and happiness. When we practice ahimsa, anger will naturally give way, the mind will become clear and will easily be controlled. Truthful words that create good are the product of a mind free from desire and anger. The purpose of the Vedic rituals is to take us, by degrees, to go beyond the three gunas and realize the true state of the Self. So long as we believe that the world is real we worship the deities so as to be vouchsafed happiness. And this world, which we think is real, is also benefited by such worship. Thinking the deities to be real, we help them and in return, we are helped by them. Living happily on this earth we long to go to the world of the celestials and enjoy the pleasures of paradise. So far, so good. But if we stopped at this stage, would it not mean losing sight of our supreme objective? Is not the goal our becoming one with the Paramatman? Would it not be foolish to ignore this great ideal of ours and still cling to mundane happiness? In our present state of immaturity, it is not possible to think of the world being unreal. Recognizing this , the Vedas provide us rituals to be performed for happiness in this world. Because of our inadequacies, we are unable to devote ourselves to a formless Paramatman from whom we are no different. So the Vedas have devised a system in which a number of deities are worshiped.